But what about when the abuse isn’t as overt? Emotional abuse is one of those things that can hide out in dark corners and be denied for decades, while it eats away at our souls. Is it abuse when you’re so sick physically that you can hardly get out of bed and your husband tells you it’s all in your head and you need to just start taking better care of yourself? Is it abuse when your husband of 26 years tells you time and again, that you need him because you’ll never amount to anything on your own because you’re just too stupid? Or makes cruel jokes about you in front of your mutual friends? Is it abuse when someone tells you they love you time and again, but never keeps his or her promises? Is it abuse when he lies or cheats, but you’re left thinking that it’s somehow your fault and you’re the one that has the problem? I think sometimes abuse of our hearts can be as traumatic as physical abuse. Of course it’s not nearly as obvious, but emotional abuse can be just as damaging to our souls and our spirits. Any form of abuse carries with it a tremendous blow on our self-worth and can lead to anxiety and depression. We know that. If endured long enough, we start to believe the lies we’re being told about ourselves. Those lies sink into our bones and we begin to believe them as truth. As if that isn’t enough, some of us will blame ourselves for our partner’s abusive behavior. All of which only makes us endure the pain for longer. Every woman I speak with wants to have self-love but they don’t really know how to get it, as if it’s something you can pick-up off the grocer’s shelves or order online. Self-love isn’t a thing you have or don’t have. Self-love is a practice that you choose to do daily. It’s telling the truth to yourself when things aren’t okay. It’s making yourself the priority in your own life. It’s teaching people how to treat us by the way we treat, show respect for, speak to and nurture ourselves. When I was in the middle of mourning a repeated broken heart within an emotionally abusive relationship, I was fortunate enough to have my best friend by my side speaking truth to me. My very wise and loving friend gave me a precious gift when she told me, “Sweetie, don’t you see…he’s stealing your light.” The gift shifted everything for me that day. 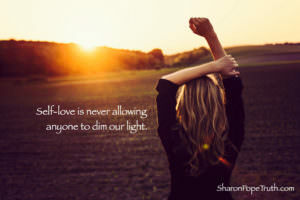 Self-Love is never allowing someone to dim our light. There is a path out and a path through emotional abuse, but it’s important to heal the hurts, so that the next person in your life isn’t just the same type of partner in a different pair of pants. I’ve been helping more and more women who are finding their courage to escape loveless and abusive relationships and find their way back to their own hearts. Working with you truly transformed my life, I was ruined, broken and more lost than I have ever been in my life. You literally were the life raft that pulled me out of the water, and coached me thru the most healing and growth I have ever experienced. I am now more of myself than I have ever been and for that I will be eternally grateful. You delivered as promised, and it was worth every penny!